Lose yourself in a mesmerizing book at these many libraries in Pennsylvania. Our extensive PA library list will certainly suit your needs for exploring and finding great books! The Oldest Cultural Institution in America! Founded in 1731 by Benjamin Franklin, The Library Company is one of the longest standing free libraries in America. Its primary focus is American culture between the 17th and 19th centuries. There are many free programs to check out including African American History, Visual Culture, and Early American Economy. Following Franklin’s vision of making books available freely to the public that otherwise could not afford literature; this library still maintains that principle today. The reading room and gallery are both open to the public weekdays from 9 am - 4:45 pm. This isn't your everyday run-of-the-mill library. Be sure to include it in your historical outing next time you're in Philly! Ever wondered if you had family members that fought in the civil war? Check out the Historical Society of Pennsylvania founded in 1824! With over 600,000 printed items, some 21 million manuscripts, and 350 plus years of American history it's sure to be a real treat. There's a small entrance fee to the library, but if you wish to donate to the society and become a member, entrance to the library is free. Their hours are 12:30 pm - 5:30 pm Tuesday - Thursday and 10 am - 5:30 on Friday. This is a must see if you're planning a historical trip in Philadelphia. You may even learn about an unknown ancestor or two! The Fiery Red Brick Library! More of spectacle to see than anything, the Anne & Jerome Fisher Fine Arts Library specializes in contemporary and historical aspects of art, architecture, historic preservation, studio art, and urban design. 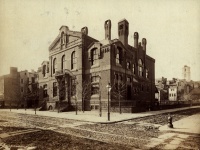 Built in late 1888 by Frank Furness, it stood out as unique for its time due to the red brick building when most architects were designing with marble. 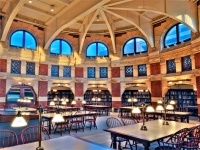 It stands as one of many libraries for UPenn students. However, it is also open to the public all year round to the public (with the exception of the end of semesters when it's held open specifically for UPenn students). It is open Monday - Thursday 8:30 am - midnight, Friday 8:30 am- 9 pm, Saturday 10 am - 9 pm, and Sunday 10 am - midnight. Truly a magnificent structure to see! The Perfect Blend of Science and Literature! A predominately scientific library, Wagner has science related works dating from the 17th century to the early 20th century. The library is especially rich in 19th century English and American works. Wagner focuses mainly on natural and physical science, archeology and anthropology, pseudo-science, and engineering. 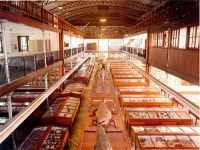 In addition to the library, there is also a free museum open to the public. Wagner is an unparalleled tool to researchers in the science field. The library and museum are open Tuesday - Friday, 9 am - 4 pm. So stop in for some interesting science collections or some vibrant scientific journals! Free and easy to locate library in the heart of Philadelphia, that has grown from a 3 room library in City Hall, now, over 200 years old and grown to 54 different locations. Quick and easy service for checking out books and returning books; this is where you want to go if you need to grab a quick read. Relaxing atmosphere to study or do homework and a great place to bring kids as they have regular story time for young children! The library is open Monday - Thursday, 9 am - 9 pm, Friday 9 am - 6 pm, Saturday 9 am - 5 pm, and Sunday 1 pm - 5 pm. You definitely want to check out this library next time you're on Vine Street!